I am a firm believer in accessorizing with a scarf year-round, be it a thick, cashmere pashmina in the winter or a lightweight cotton or silk scarf in the summer. During the fall, you'll find me in a different scarf every day of the week! 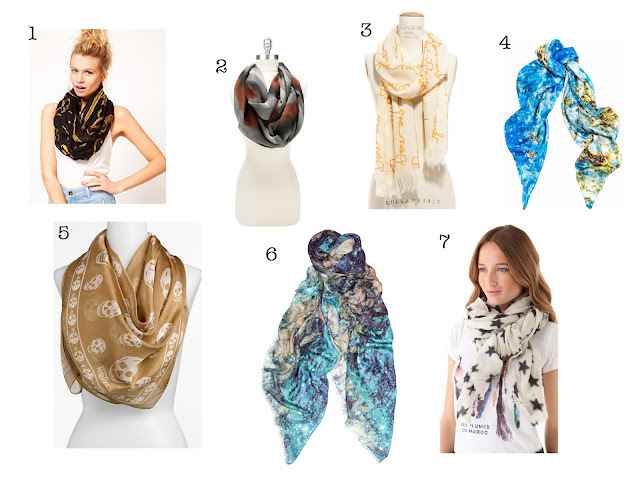 I put together some of my favorites for this season (I'm really feeling this celestial blue, and a printed word scarf?? I sense some purchases in my near future). The best thing about scarves is how easily they can make your outfit! I'm a huge fan of my white v-neck T's (seen here) and tossing a great printed scarf on top makes me feel ready to step out the door.